by Love, Jimmie in Aack!, Imparting Wisdom Tags: Humor, Wash Your Hands! See this here picture? I took it at Kroger one day last week. Is it because I’m a woman that my thought process went like this as I walked by? 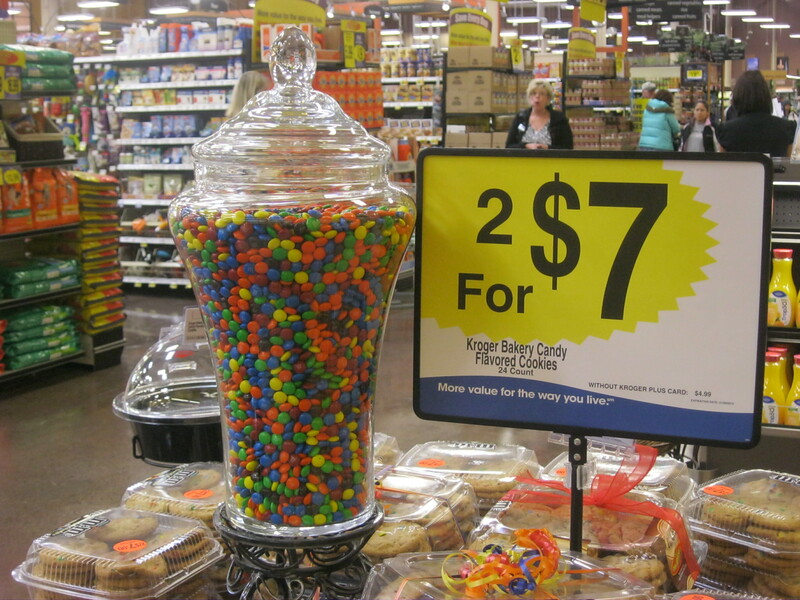 Wow, that’s a LOT of M&Ms. Gosh, they look good. What a colorful display. Kind of wasteful though. I wonder how many bags they had to open to get that thing full. What are they going to do with them once they take the display down? Hopefully, they will put them in the break room and the employees will get them but they’ll have to include a scoop because no one will eat them once everyone has had their paws in them. Gosh, that is just SO wasteful . . . all that chocolate . . . Cute, though. And after he finished the first handful, he must have thought Yeah, that was tasty because he went back for a second handful. FYI, men, public decorative displays of food are not for snacking. I just thought you should be aware. Previous I’m Just A Stereotype Waiting To Happen Next A Rant. Oh, Goodie. Good to know you didn’t die. And you’re right on point with what most men would do in this situation. Ooh, Snack! And reach in and grab a handful and walk around the store, swing back by and grab another before heading to the check-out. Yes! And they pull chunks off the gingerbread house you just spent three hours on! What is that? Crap! You’re not supposed to eat those??? ?